I can say I am a late bloomer when it comes to antiques and vintage stuff... When I was growing up, my mom always bought everything new, and I am sure she would be absolutely horrified if she knew I actually pay money for chippy old furniture...!! Only recently do I remember my mom actually starting to enjoy going to antique sales and flea markets, so we always try to do that when I am visiting in Lisbon...!! It wasn't until we purchased our first home, a couple of years later, that I started finding myself... 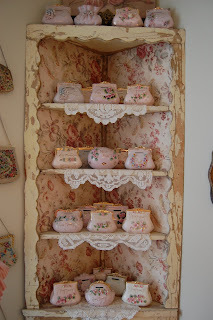 I had discovered Rachel Ashwell's shabby chic decor, and BAM, fell in love!! But I really didn't know how to go about it, so I started buying all these reproductions that had the shabby look...! Slowly, I realized that I could actually find the real deal for not so much money, and sarted becoming a more savvy and selective buyer. At that same time, I began selling items at a local antique mall with my friend Lisa (we barely knew each other when we got started, but we knew we liked the same things, so we decided to jump right in!!). 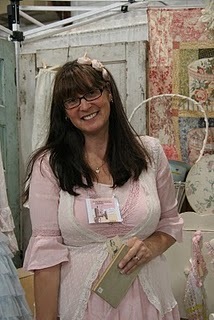 Now, I feel this insatiable thirst for antiques and vintage, and I want to learn as much as I can!! I have so many things around my home that I love, but there are only a few that hold a very special place in my heart , and I would like to share them with you. 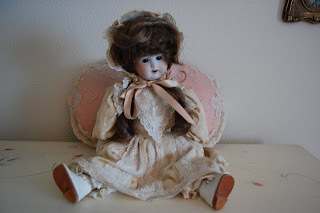 This doll was given to me by my paternal grandmother, just a few years before she died. I wish I had asked her more about the doll, as I really don't know anything about it!! My paternal grandfather was a german salesman who ended up leaving Germany and settling in Lisbon in the early 1930's, when things were starting to look ugly for the jewish people. My grandparents traveled a lot around Europe, so I'm pretty sure it was purchased in one of their travels. 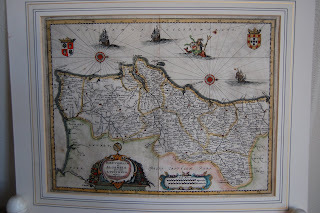 Another special item I am proud to own is a very old map of Portugal, believed to have been drawn in the 17th century!! The real interesting thing about it is that Portugal is drawn laying on it's side, with north to the right and west on top...!!! The amount of information already known in the 1600's blows me away! The large travelling trunk belonged to my great aunt and was the one thing I chose when allowed to pick one thing from her estate. 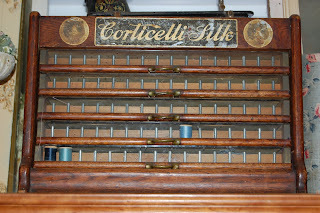 The large old bobbin cabinet used to belong to my friend Jeanne, I had always admired it, so one day she offered to trade it for a Singer Featherweight, and so it became mine...!! And the collection of pin money banks was one of the first collections I started shortly after we bought our home six years ago!! The majority was found on ebay, and they all sit on a chippy corner cabinet in my bedroom! I am excited for the road ahead, and can't wait to see what more special things will be added to my adventures in antiquing!! 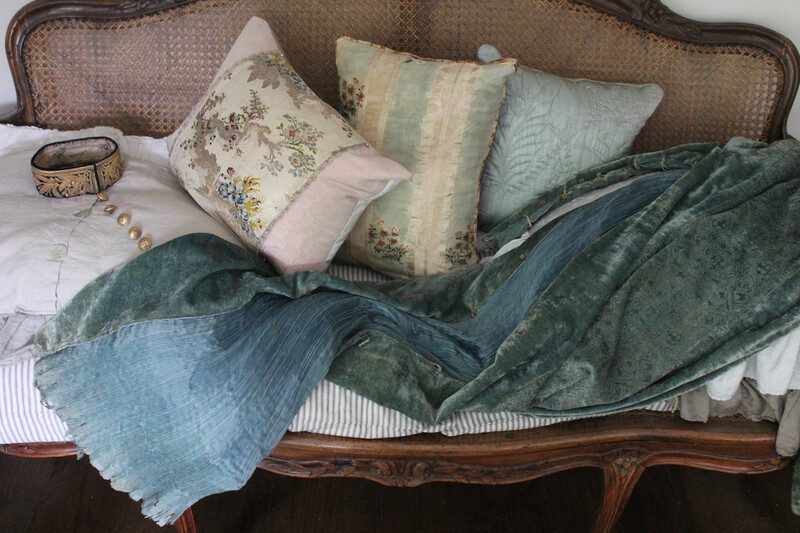 I have always liked the old and the primitive the better adding a little shabby chic to warm it up. I loved your story how you evolved to where you are at now. You have had some great adventures and saw some great countrys. Oh I loved Portebello Road, the finds. Loved your diary of your life. see you at farm chicks next week! Love this one! Get your stuff ready I know it will be a fun show! Antiques are absolutely the best and take years of "growing" to appreciate them. My mom always took me to sales but I never fully understood what it was all about. Then trips abroad ensconced in all this history just added to the desire to learn more. It's a disease and a good one at that! 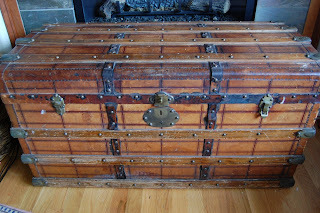 I love that old trunk...all your pieces are just fabulous. Here's to the hunt! You're doing better than me... 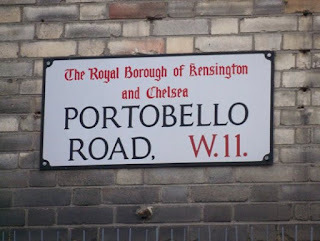 I've only been to Portobello once! !